Abdoul Ahmed, second from left, is pictured outside his mechanic shop with his apprentices, Agadez, Niger, Feb. 20, 2018. For this ancient town on the southern edge of the Sahara, the flow of desperate migrants trying to reach Europe used to be a boon, not a burden. 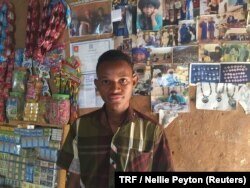 Abdoul Ahmed, a 31-year-old mechanic in Agadez, measured the good years in customers. When arrivals in Europe peaked in 2015, dozens of cars came to his workshop each day to get their tires changed before setting off across the desert. But since the European Union cracked down on migration a year later, his daily clientele has dropped to one or two. That earns him about $4, to be shared with five skinny teenage apprentices. "Times are bad. 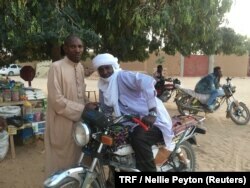 There's no activity," he said, sitting along one of the few paved roads in Agadez, a mud-brick town where beat-up motorcycles outnumber cars. For years, the old trading post in Niger has been a key stop for West Africans traveling north — mostly young men fleeing poverty in search of better opportunities abroad. It is the place where migrants find smugglers to arrange their trip across the desert. Those ferrying the travelers earn hundreds of dollars for each person they cram into the back of a Toyota Hilux. Local men pose for a photo on a downtown street corner, Agadez, Niger, Feb. 20, 2018. But smugglers have not been the only ones to benefit from the migrant boom, said Sadou Soloke, the governor of Agadez. Cash from feeding, housing and transporting migrants fed thousands of people in the area and helped develop the impoverished region, he told Reuters. That activity began to slow when Niger, under EU pressure, started arresting smugglers and posted soldiers across the desert in 2016. By late last year, the life had been sucked out of the once-bustling town, several residents said. Now corners once crowded with merchants are quiet, and wide streets are empty even at midday. Men on motorcycles gather in patches of shade, waiting hours for someone to request a ride. "We worry for the people who used to provide services to the migrants," Soloke told humanitarian workers last month. "Now they've been put in a risky situation too." As more people move around the world — spurred by climate extremes, conflict and poverty — migration has developed an economy of its own, one many people rely on for an income. That reality can make efforts to brake or shift migration harder — and riskier — to achieve, as they affect everything from powerful criminal networks to vulnerable people just trying to get by. In Agadez, about 6,000 people who were directly employed in the migrant economy are now jobless, the governor said, while countless others — shopkeepers, phone sellers, mechanics — have also seen their earnings fall. While aid agencies have swooped in to help migrants still stranded in the town, local people feel increasingly marginalized, said Ottilia Maunganidze, a migration analyst at the Africa-based Institute for Security Studies. "The primary question they ask is ... why is the aid going to people who just got here, when in fact we are suffering just as much but we've chosen to remain at home?" she told Reuters. Niger is one of the poorest countries in the world, ranking second to last in the latest U.N. Human Development Index. Agadez used to survive on tourism, with Europeans flocking to see its 16th-century clay mosque and sultan's palace, until fears of terrorism scared them away, locals said. A view of downtown Agadez photographed from the grand mosque, Agadez, Niger, Feb. 20, 2018. Then the Libyan revolution that removed Moammar Gadhafi from power created a security vacuum between Niger and the Mediterranean, and migration surged. Three years ago, 100 to 200 overloaded pickup trucks would leave Agadez in a convoy every Monday at sundown, kicking up dust as they sped down routes once traveled by salt traders in camel caravans. Each trip to Libya could earn a smuggler about $5,000, said Giuseppe Loprete, country head of the International Organization for Migration (IOM). Now smugglers charge even more, but overall earnings have plummeted since only a few vehicles make it past the checkpoints, he said. "Communities are losing their main income," said Loprete, explaining that migration revenues sustained not only Agadez but other desert villages along the route as well. His organization is running cash-for-work programs in the region, paying locals to help dig wells or install electricity. Loprete said such efforts will "buy some time" until people are able to come up with more lasting solutions. But nothing will replace the level of income they had, he said. Eager to occupy people with something other than migrant smuggling, the EU is also funding alternative employment programs, offering to buy ex-smugglers equipment to start farms or carpentry shops, for example. Niger is one of several West African countries where the EU has struck or is seeking deals to cut migration, offering development aid in exchange for tighter borders, and threatening trade consequences if there is a failure to cooperate. Local government officials said they are counting on the jobs program, which has only just got under way. Privately, aid workers laughed when asked if they thought it would work. Used to making thousands, smugglers are unlikely to settle for meager profits from a farm stand, several said. "I think the EU is trying," said security analyst Maunganidze. "But the obvious challenge is that solutions have to be longer term." Many former smugglers will likely take up other criminal activity, such as drug trafficking, to maintain their income, she said. Some may also be drawn to join violent extremist groups in the region, she added. Niger is warding off violence on several fronts, with Boko Haram insurgents encroaching from the south, al-Qaida-linked groups operating to the west, and various militia fighting in Libya to the north. Conflict has yet to break out between Agadez residents and migrants stuck there, but officials, aid workers and analysts say the risk of tensions is high. The regional health department complained last month that three dozen local and international aid groups were providing health care to migrants, while none were supporting local people, according to one source who took part in the discussion. Aid agencies said it was easier to access international funding by working with migrants. "[NGOs] come with good intentions, but they shouldn't forget that locals are also in need," said Ali Bandiare, president of Niger's Red Cross. Ignoring them "could create a situation that is unmanageable in terms of security," he warned. Off one small street in Agadez, a family sat on a dirt floor in what appeared to serve as a jewelry workshop, convenience store and living room, all at once. On the wall were faded pictures of the patriarch posing in his turban with smiling tourists, and a certificate received by a son last year for completing a course in traditional jewelry-making organized by the IOM, the U.N. migration agency. Abdoul Afori poses for a photo in his family's jewelry workshop, Agadez, Niger, Feb. 21, 2018. Abdoul Afori, 20, found the course interesting, but said there was no one to buy his goods. "No one has helped us," said his father, Mohamed. Around the corner, car mechanic Ahmed scanned the dusty street as his apprentices slouched in boredom. "With time, it will change again, God willing," he said.